Journey, a 4-year-old golden retriever was trained to detect high or low levels of blood sugar in Tina Westmoreland's 15-year-old daughter Hannah, who was diagnosed with diabetes in 2012. (QUINLAN, Texas) — They didn’t hear the gunshot. 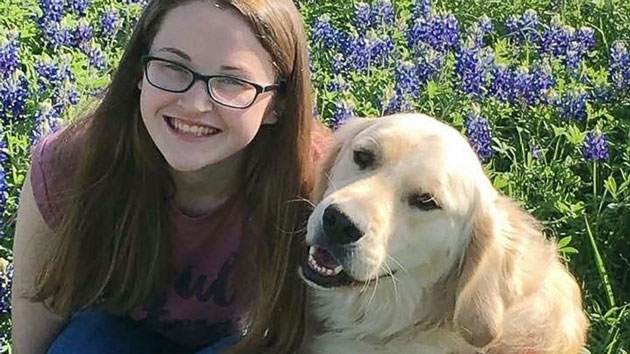 But when Tina Westmoreland went to water the plants in the front yard of her home in Quinlan, Texas, on Sunday morning, she found her daughter’s diabetic alert dog laying there. The 39-year-old mother of four had just made pancakes for the kids and was unsure how the 4-year-old golden retriever got outside. She immediately called the vet but didn’t see the puddle of blood until her father lifted the dog into the car. They rushed the dog, named Journey, to an animal hospital where he died from the gunshot wound. The family is devastated. “It’s been awful for us all,” Westmoreland, a fourth-grade math teacher, told ABC News in an interview Tuesday. Journey was trained to detect high or low levels of blood sugar in Westmoreland’s 15-year-old daughter Hannah, who was diagnosed with diabetes in 2012. Journey had been with the family for the past three years and went everywhere with Hannah: to school, church and even camp. Westmoreland said she reported the incident to the Hunt County Sheriff’s Office, and then a game warden contacted her Monday night to tell her he was investigating. The sheriff’s office did not respond to ABC News’ requests for comment Tuesday. A spokesperson for the Texas Parks and Wildlife Department confirmed that a Hunt County game warden is assisting with the investigation.